How did Creekside Orthodontics history begin? 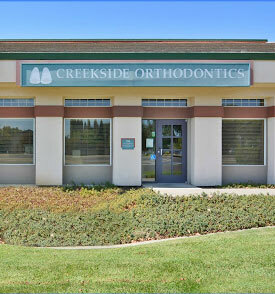 Originally, we were located in the Creekside Office Complex located at Alamo and Nut Tree Drive here in Vacaville, hence the name Creekside Orthodontics. Dr. Anderson and Dr. Portalupi joined forces in January of 1994, although Dr. Anderson had a small beginning in August of 1988 by renting space from a general dentist friend of his. Together, Dr. Anderson and Dr. Portalupi moved to our current location in June of 1996. Our practice is rare in that we started the practice from scratch. It has been the perfect opportunity to serve the Vacaville community and have a partner with whom to coordinate treatment plans. We have continued with that tradition with the acquisition of Dr. John Crawford’s practice here in Vacaville and welcome his patients to the practice. Dr. Crawford continues to practice a couple of days a week and Dr. Portalupi will transition this winter to his Woodland location only. We approach our orthodontic patients with a healthcare-first model, having specific goals in mind for our patients. Foremost is to satisfy the patient’s main concern, second is a list of goals that have to do with function of the TM joint, dental aesthetics, facial aesthetics, breathing airway issues, bone, and the supporting periodontal structure that will produce a lasting and stable treatment result. This approach is unique, but we cannot take credit for it. We feel this is the best way to deliver a more healthcare-centered approach to orthodontics, rather than just a tooth-alignment focus that is concerned only with “straight teeth.” As far as “straight teeth” are concerned, we desire to do that better, in the most efficient way (quicker) than any other office, and educate our patients as to why the other goals are equally important. Dr. Anderson has become over the past 20 years very involved in this approach and had the privilege to be Roth Williams International Society of Orthodontics president from 2003-2004. This philosophy is only being taught in some exclusive centers throughout the world. Dr. Anderson looks forward to the future as he is now only in one location dedicated to the patients in this community in which he works and lives.